At the next-to-last scheduled forum on the Obama administration’s Rural Tour, no one mentioned the cap-and-trade bill aimed at limiting climate change — until Agriculture Secretary Tom Vilsack, who is making all the tour’s stops, brought it up in a briefing with reporters after a community forum at the Scottsbluff National Monument in Gering, Neb. “Vilsack said while he understands there are things that need to negotiated, Congress needs to address the issue,” reports KRVN 880 Rural Radio. “Vilsack said ‘the climate is in fact changing’ and in the administration’s view will have a greater impact on forest and farms and be more costly to mitigate if something is not done now. Vilsack said he was surprised the issue did not come up during the town hall meeting.” (Read more) It may have been mentioned at an invitation-only meeting that Vilsack had with area business leaders before the forum. 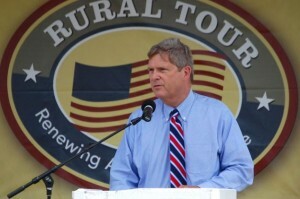 Vilsack, a former governor of Iowa, was accompanied by Interior Secretary Ken Salazar, a former senator from Colorado. The stop was “Salazar’s first visit to a small unit of the National Park Service since he took office earlier this year,” reports David Hendee of the Omaha World-Herald. The tour’s last scheduled stop is Wednesday in Las Cruces, N.M.